A range of bottled teas designed to be a mixer for whiskies and other spirits has been launched in the UK by Benjamin & Blum. The range can also be enjoyed neat as an alcohol-free drink. There are two expressions, each using leaves selected for their rarity and taste profile: the Darjeeling White Peony is grown at high altitude in Darjeeling and hand-picked once a year; and the rich Connoisseur’s Oolong is grown in New Zealand in perfect growing conditions for tea. Cold brewed in Britain in small batches, using Scottish spring water, each drink is rounded off with starflower honey from the Cotswolds and orange. The infusion is then bottled by hand in bespoke glass bottles. The bottle was designed by Nick Woodley, creative director at Sabotage Design in London, the agency behind all of Benjamin & Blum's packaging. It is made in the UK by Stoelzle Flaconnage, specialists in spirits bottles and decanters. Woodley says: "The bottle combines a classic elegance with a hint of mystery, using design elements from across the world of luxury good, including spirits and perfume. The geometry harks back to the heyday of Benjamin & Blum's predecessors, while the sculpted sides hint at the shape of the tea leaf and the petals of the lily in Benjamin & Blum's logo." On the bottle design, Benjamin says: "Just as with prestige spirits, if you have a special drink, you need to put it in a special bottle. When it comes to packaging, many non-alcoholic drinks brands focus on shelf visability. We focus on the experience. If you are in a top bar or restaurant, the drinking experience should match the occassion." 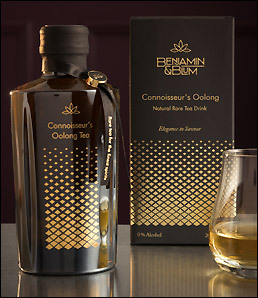 The Connoisseur’s Oolong complements almost all whisky styles, including peated whiskies. The Darjeeling White Peony pairs well with brandies and fruity whiskies as well as bourbons and aged rums.